The SIGNificant Server makes it very easy and convenient to enhance an existing infrastructure with all the necessary functionalities for a total paperless process. Beyond the possibility of capturing a handwritten signature by using a broad range of signature capturing devices from various manufacturers (including mobile signing on iPad and Android devices), also smartcards, tokens and software certificates are supported. Given the high scalability of the SIGNificant Server, millions of electronic signatures can be generated automatically and verified every hour also in mass signature processes, enabling companies to realize a TRUE paperless environment. 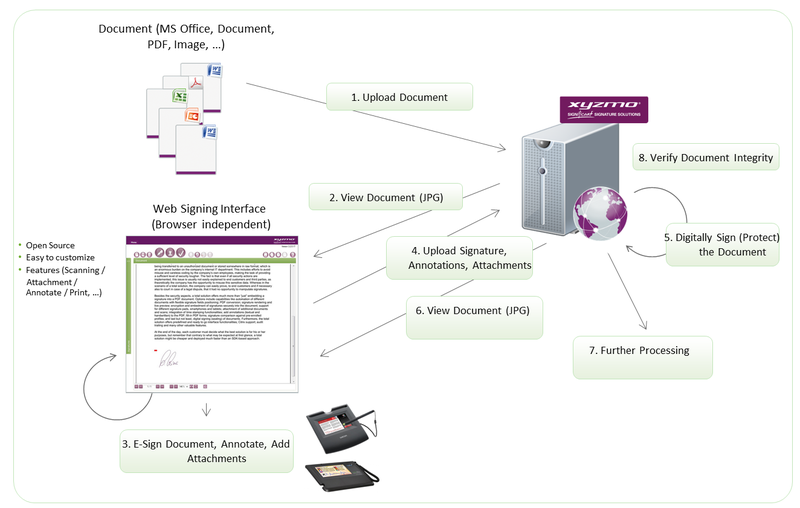 Acquiring additional data in order to complete a form can be done simply by scanning or swiping a credit card or driver s license or via a soft keyboard displayed on the signature pad. All documents can be converted into secure PDF files or into protected xml files.